There are a lot of choices to be made when deciding on items for your wedding registry and it can be overwhelming. 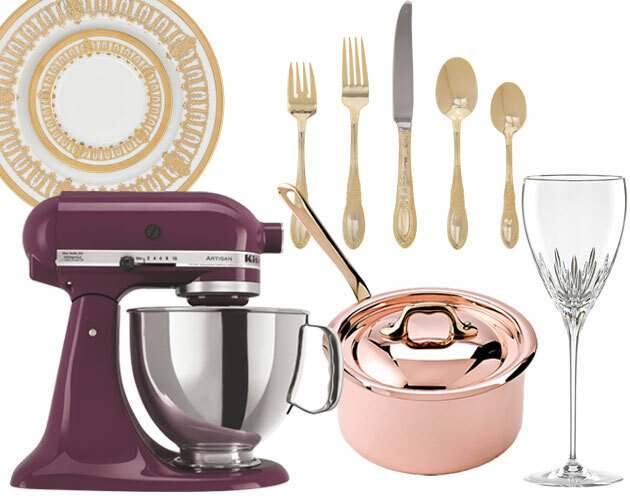 There are great items to put on your wedding registry for the kitchen. Especially if the married couple love to cook. Food Processor— A practical gift that will get tons of use–chopping vegetables, pureeing dates, making guacamole. KitchenAid Stand Mixer–When we were registering I told my husband this was “too much” and no one would buy it for us. He said we should put it on our registry anyways. And he was right. I have been blessed with the cheery buttercup mixer to help me whip up cakes, cookies, pancakes, pizza dough, and everything in between. Immersion Blender –Perfect for using in soup and bisque to create a creamy texture or mixing up a quick smoothie or humus. George Foreman Grill–If you didn’t get one in college or in your bachelorette days, get one now! Ours has the removable grill plates and we use it at least once a week to make burgers, grilled sandwiches, and chicken all year-long! Another great area for your wedding registry. High quality sheets–Register for one ridiculously expensive set of sheets and one nice, but not as pricey set. I love 450 plus thread count sheets. Anything less than that I have a hard time sleeping. Board Games–It’s something you may not think about, but getting a couple of fun group and one on one games is a great idea! Then you will be all set for hosting game night at your place or a date night in! Some of our favorites are Sorry, Scrabble and Clue. Soft throw–I’m a sucker for a warm blanket to curl up with while reading or watching movies. A big soft one is perfect for cuddling! Something with Your New Initial–Whether a monogrammed door mat or beach towel or coffee cup or galvanized letter for your new gallery wall your new home needs something to represent your new life together! This is an area you would probably not think about for your wedding registry. Camp chairs–No matter what you will probably want these–for extra seating at barbecues, baseball games, parades, maybe to sub in until you get your couch delivered. 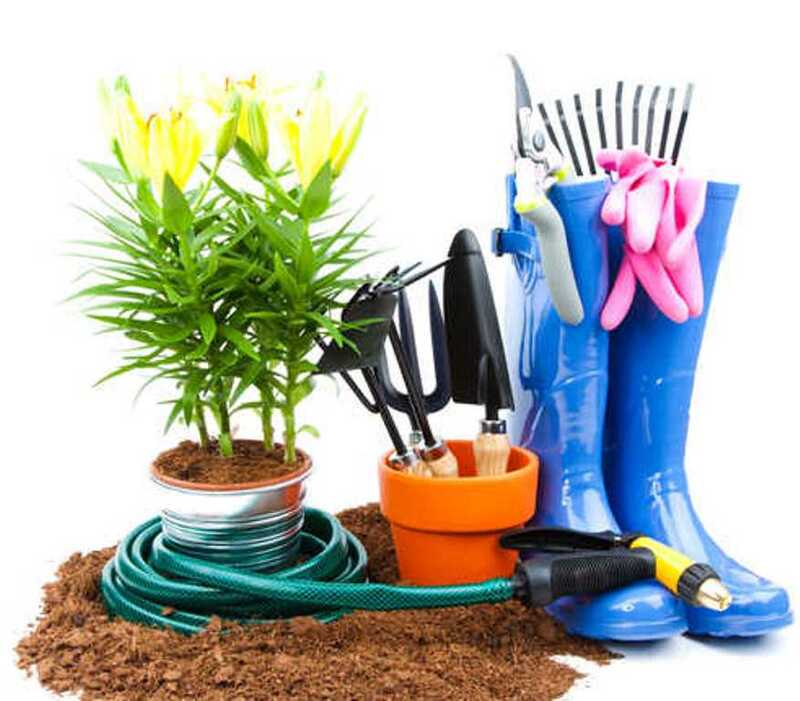 Basic Gardening Supplies–Rake, snow shovel, gardening gloves, hand trowel, hose–not things you think about, but they will definitely come in handy! Basic tool kit–If your husband to be (or you, let’s not be sexist here) doesn’t have a set of tools, get a basic one to start out with. Even if he has some tools, he may not have everything you need or random things like an Allen wrench to set up all your Ikea furniture. Wreath for your Front Door–Nothing says “Welcome Home” like a beautiful wreath on your front door! Your wedding registry will be the guide your friends and family use to help you start off your new married life together. Make your choices thoughtfully and with a wide variety of price points. Consider what you will actually use and what is a novelty. Remember you can always go back and edit your registry too! Getting married is one of the most exciting times in your life, and choosing a wedding hairstyle can be overwhelming and confusing. Your wedding hairstyle can make or break a stunning bridal look, and it is important to have the right advice when choosing a wedding hairstyle. Choose Your Wedding Dress First – Your wedding dress must be the deciding factor for everything else around it; the wedding hairstyle, the accessories, the flowers, the bridesmaids dresses, everything. Don’t rush off and make your stylist commit to a single wedding hairstyle. Be Prepared to Be Flexible – A good hairdresser who specializes in wedding hairstyles will be able to discuss all the options with you, taking your dress into account, your hair texture, whether you are wearing a veil or not, and if you plan to wear flowers or anything in your hair. Keep It Real – Your wedding day is an extremely special day and doesn’t mean that you have to beat your hair into submission to be something it is not. Be yourself and be comfortable with your wedding hairstyle. Book a Trial – This point is very important when it comes to your wedding day, just because your stylist is a wedding specialist, doesn’t mean they do wedding hairstyles that you will like. Book a trial appointment and get an try all types of wedding hairstyles until you find the style that is perfect for you on your wedding day. The Veil – So the thought of you wearing a veil makes you feel rather faint, but sometimes the veil just makes it all come together. Wearing a veil is a very personal issue and these days have more of a style statement and less of a religious one. There may be some requirements from certain churches and religions, but again that is completely a personal matter. Short Hair – Wedding hairstyles conjure up images of long, wavy locks with pearls and diamonds or swept up sleek, classical looks. But many Brides these days are doing away with tradition and keeping their hair short for the occasion, and although styles are somewhat limited with short hair, it can make for a really dramatic entrance. 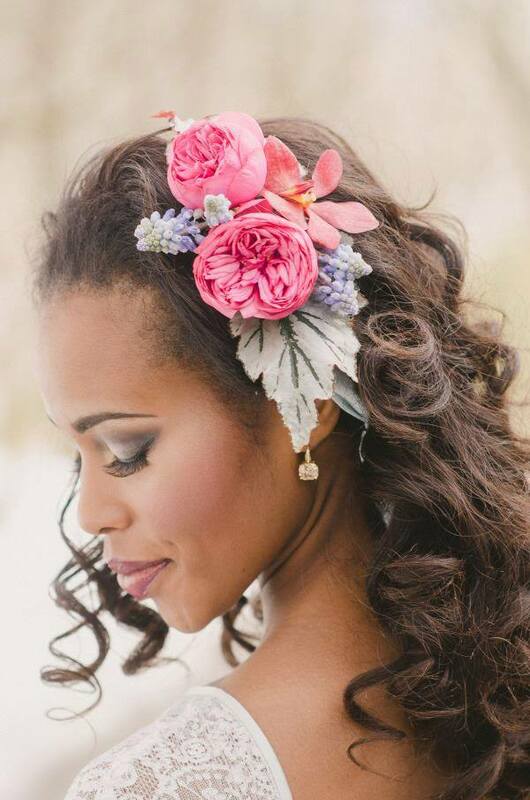 Wedding hairstyles are a very important part of the bride’s look. It is most important that it reflects the bride’s personality and flair. Find a good wedding hairstylist who will work with you in the months coming up to your wedding and tailor make a wedding hairstyle that is perfect for you and that you LOVE!!! What is a sit-down dinner wedding reception? Well it consists of several plated courses served to your seated wedding guests. You select from a first course, perhaps a soup, salad, entree, perhaps an intermezzo, and each course is brought to your guests’ tables, with friendly, experienced wedding servers bringing guests the entrees they desire. Can I afford a sit down dinner wedding reception? Draw up a budget. It is most important that you know exactly how much money you’re working with, as well as how much of your wedding budget you can designate to a sit-down dinner. This budget is not just for the sit down dinner wedding reception. Figure out how many guests you can invite. A sit-down dinner wedding reception can cost anywhere from $30 to $150 per person. If you’re inviting over 200 people, you may want to stick to the lower end of the spectrum, but if you’re only inviting 50 people, you may be able to spend a bit more. Decide how many courses you want. In most cases, the more courses you have, the more expensive the meal is going to be. Cut courses to save on cost. Do your research. Before you go anywhere, look up caterers you are interested in online and see if you can get a quote. 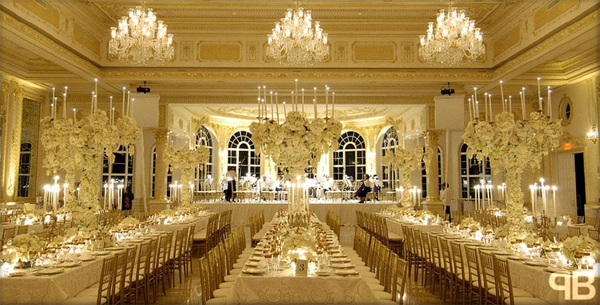 If you cannot get a quote online, make appointments with different caterers. Be honest about your budget. If the caterer is out of your price range, it’s better to know early. Similarly, if the caterer knows your budget, he or she may be more likely to work with you on cutting costs. 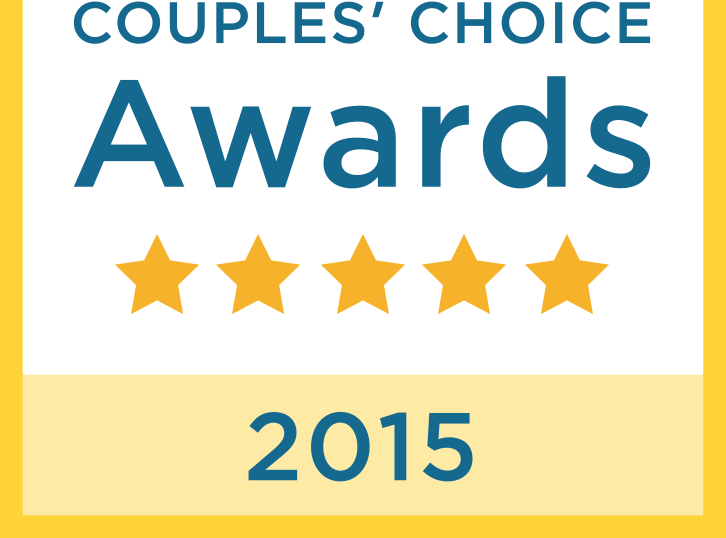 Go to tastings to find your perfect caterer. Plan the menu. Once you decide what caterer to use, you will need to finalize what food to serve at the sit down dinner wedding reception. See if the caterer will give you any discounts if you order certain foods to be served. For instance, chicken is usually cheaper than seafood. Save money for the bar costs. If you are doing an open bar, you will probably have to play a flat fee (usually about $10 per person) for alcohol. Even if you are having a cash bar, you will have to pay for the bartenders. Bottles of champagne are usually extra, so keep that in mind if you plan on doing a champagne toast. Choosing your wedding cake and wedding cake topper for your special day can, at first, seem like a major problem for someone who has no idea where to start in the process. Consider whether or not you have to adhere to a budget. If you do have to consider keeping in the confines of a monetary limit, set that amount firmly in your thoughts and proceed from there. If not, then you will be more likely to find something that is uniquely made and special, just for you. Try and anticipate just exactly how many this confection has to serve. The bigger the number of guests, the bigger the cake will need to be. Assume that everyone you have invited has responded positively and will, indeed, be coming to the reception. See if anyone you know has any recommendations for any bakery that has served them successfully. Look at the various wedding cake toppers to pick the one that you like best. If not, see if there are any bridal shows being held in your area (many take place in the first month or so of the year) where you can go and see examples of what local specialty bakeries have to offer. Many of them will have portfolios featuring pictures of their past wedding cake creations to give you a better idea of what they are capable of producing. If you see anything that particularly impresses you, be sure you get one of their business cards so you can make an appointment to meet with them and discuss your needs at a later time. Make an appointment with the one or two bakeries where you would like to have a cake tasting. At this tasting the bakery will offer you and any who accompany you, several different examples of the flavors of cakes and fillings that they can offer you. Try to have an idea of what you might prefer. These bakeries have a good idea of how big a wedding cake will be needed to serve the number of guests you are expecting. Discuss what kind of wedding cake you would like to have as well as the wedding cake topper that will look best with it. This includes the shape of the cake, what kinds of colors or special decorations you would like to see. If you have a preference for wedding cake topper (like a ceramic or porcelain piece or using fresh flowers that reflect those used for the bridal bouquet or other decorations), now is the time to discuss them. 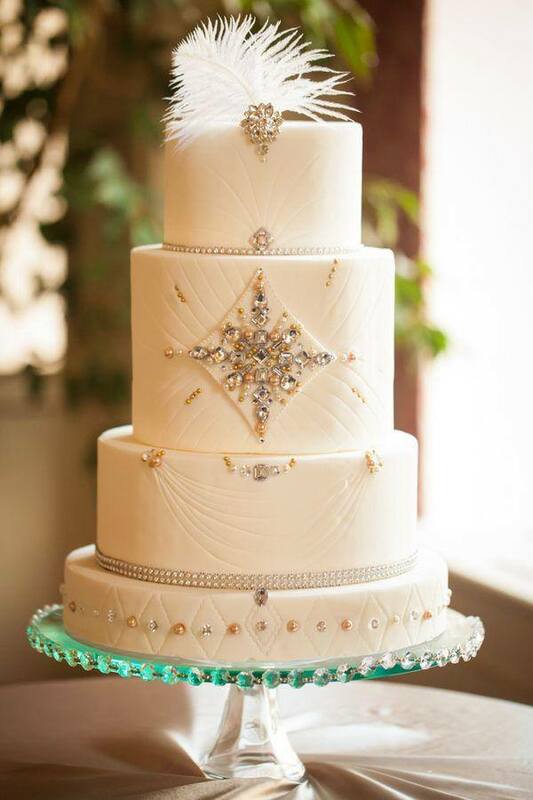 Depending on the ingredients used, the amount of labor that goes into the production, size and the use of non-edible decorations like hanging Austrian crystals, all will affect the cost of the cake. It is not unusual for a relatively modest cake to start at $500, with costs going up to $1500 and over for larger creations.